The USPS has a weird system for mail carriers that want to transfer to another post office. Rural carriers can’t directly ask for a transfer, they must go out and find another carrier to trade offices with. I mention this because my wife works for the post office and we were recently looking to move to Washington from Florida. Finding someone to trade with is ridiculously difficult. People often spend years trying to find someone in the state they’re looking for. We had spent months posting on forums and looking through transfer ads without making any progress. We were losing hope and getting desperate. I was racking my brain for a solution but couldn’t think of anything. 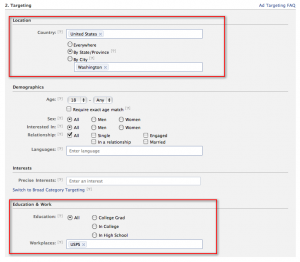 Luckily, around that time, the awesome Noah Kagan sent me an AppSumo video on Facebook advertising that blew me away. I immediately saw how with the insane targeting that Facebook allows, I could effectively reach rural carriers in other states. Note that I probably could’ve made it easier on the person by adding a Wufoo form in there but I thought that it might feel too impersonal so I gave out my email address instead. It’s just a very simple ad that speaks directly to the person viewing the ad. 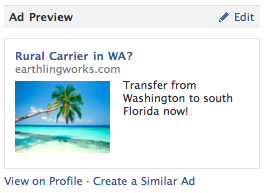 I made sure to include “WA” and “rural carrier” in the title because I knew that seeing an ad that can identify where you live and what you do is a powerful way to get someone’s attention. 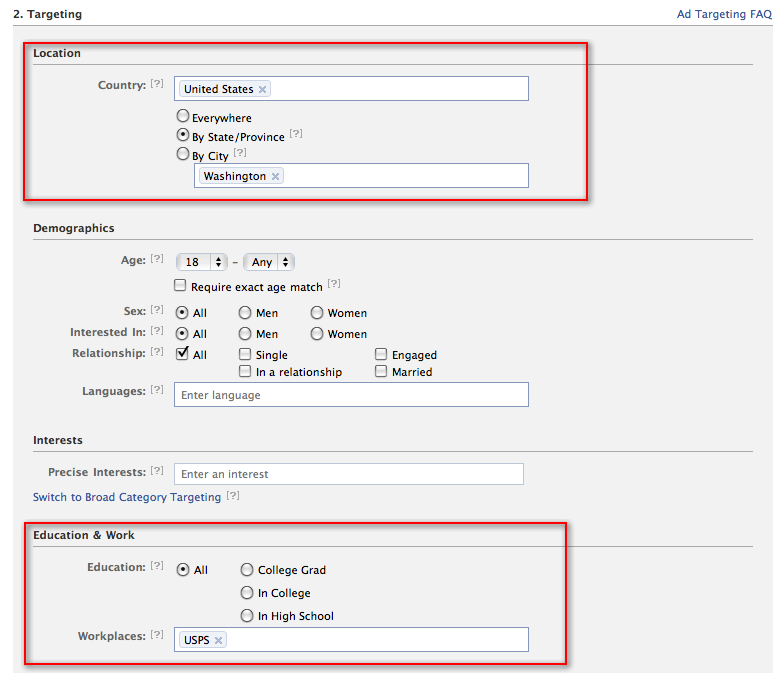 This is why Facebook advertising is awesome. Where else can you do this type of targeting? The estimated reach was only 850 people but when we’re targeting like this, that’s more than enough people. I created another one just like this for Oregon and set my bid to 88 cents per click. Once my ads passed the approval process and went live, I started getting visits to the landing pages. I was only getting a handful of visits but this was the right type of traffic. I ran the ads for about a month and got about 5 people to email me in that time. It just so happened that we ended up doing the transfer with someone from one of the forums, but I’m positive that one of those Facebook leads would’ve eventually worked for us. It’s been a while since my last post where I talked about quitting my job so I figure I’m due for an update. Lots has happened since I quit my job and I’ve almost settled into a routine. Don’t really have a routine yet because of the big move to Washington state. It’s been about three months since I stopped working for the man and with all the other stuff going on in my personal life I’m just starting to enjoy on my own. I actually took about a month and a half off so I’m just now getting into a routine. I’m not a morning person so when I had a job I was always rushing in the morning because I was late. Totally the wrong way to start your mornings! Nowadays I take my time and ease into the mornings. It’s great and I’m really enjoying the freedom. I work on Bidsketch related stuff about 3 or 4 hours a day (which includes 10 to 20 minutes of support). The rest of the time I’ve been spending packing or doing other chores. Needless to say I’m looking forward to settling into a different routine when I get to Washington. I’ve been to LessConf, SuperConf and MicroConf in the last three months and had an awesome time at each of them. There’s so much to cover on the conference front that there’s no way I’ll be able to cover it all here; I’ll follow up in the next few days with more details. For now, I’ll just say that the thousand or so dollars that I spend going to these conferences is waaay worth it. Bidsketch has been growing at a nice pace lately. In fact, I’ve almost doubled my revenue since I quit. It’s funny, I didn’t expect for it to earn this much when I first launched. That said, I do have days where I feel like it’s not growing fast enough. Go figure. I just have to stop and remember to enjoy the journey when that happens. Lots to cover on the marketing front. Too much for a summary so I’ll have to put out several posts about the sorts of things I’ve been doing and what I’ve learned these last few months. I’ve been digging into analytics and have tried a few interesting experiments so far. Nothing that has doubled my revenue by itself so far but there have been a few interesting moments. I’ve been waiting for this day for a long time it seems. I had thought of all kinds of scenarios for how I might do it and what I might say but nothing prepared me for what actually happened today. I’m still in a bit of shock and I haven’t processed everything yet but it’s starting to sink in right about now. Last night I was extremely anxious about having the talk with my boss. I kept trying to come up with the right words to say but couldn’t think of anything at all. As political as the environment has been at my job, my boss has always treated me with respect and she’s always been good to me so I knew it wasn’t going to be easy. What actually happened was even tougher than I what I had imagined. First, I came in to work and she wasn’t even there! Offsite meeting all day. Great. Soon there was a rumor floating around that the other senior manager actually gave his notice and she was so furious that she told him to leave immediately. I have no clue if this is true but it certainly didn’t fill me with confidence at the thought of giving my notice a couple of hours later. Anyways, my boss freaked out and cut her offsite meeting short. She came into the office and started running around and planning her next steps. Unfortunately for me her next steps included putting additional people under me. She came into my office and closed the door. “I think Barry should be under you now. You know more about what he does and…etc.” I’m not 100% sure what she was saying at this point because I couldn’t believe what was happening. I snapped out of it long enough to realize that now was the time to tell her. So I did. I told her, as gently as I could, that it probably wasn’t a good idea because I had decided to leave the company. I said that my business was doing well. Well enough to support my family and that I needed to focus on growing it even more. Her reaction? Well, I didn’t get thrown out of the building which was great. She told me congratulations, and said that she knew that I would do great because I would be great at whatever I chose to do. She said that I had to do what was best for myself and my family and that she just wanted to see me be happy. Basically, she had nothing but nice things to say. Wow. I didn’t expect that but I was extremely glad it went in that direction. It was a crazy day but in the end it all somehow worked out. My last day will be March 11. As I mentioned earlier, it still hasn’t 100% sunk in yet but I’m slowly getting there and I’m excited about what this means for my future. I’m quitting my job. Yep, tomorrow is the day that I give notice at my day job. I’m blogging about it to have a written record of the whole thing because it’s such a major event for me. I’ve worked at my job for a long time — just over nine years. I can’t say that I enjoy doing what I do anymore. I’m a manager of a great team, which is satisfying in many ways. But I’m a senior manager so I don’t even get that much time to run my own team anymore. Nope, my day is mostly about going to meetings and shielding them from a very political environment. Not fun. So while I’m super excited about leaving the job, I’m anxious and maybe a little nervous. I’ve worked there for a long time and I like some of the people. My boss has always been good to me but she tends to be unpredictable with things like this so I’m really unsure how she’ll handle it. I’m certain it won’t be an easy conversation and I’m not looking forward to that part. Either way, it’ll be a major relief to finally give my notice and have my own projects and products to look forward to.